Print FD-258 form on a plain A4 size white paper and write with BLACK ink including fingerprints. You can take the fingerprints yourself if you are outside USA like in India or any other country. I tried taking fingerprints myself as it seemed pretty easy using this official FBI fingerprint guide. But the ink was just messing up the fine finger lines and merging them. So, it is better to take the help of experts. 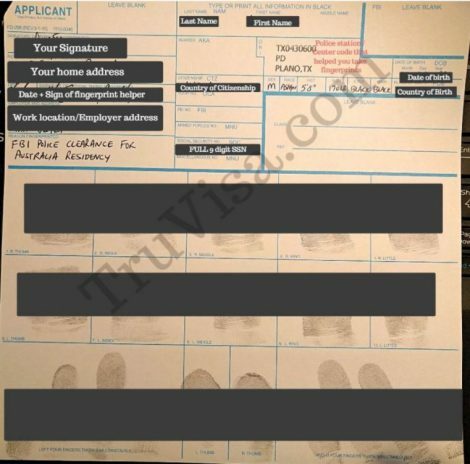 If the fingerprints are not good, FBI or other state agencies will simply reject your application. Local state and town police station in USA charge anywhere between $5 to $10 for each person’s fingerprints. They provide the form FD-258 too. So, you do not need to print it yourself. Most of them will take the fingerprints again for free, if the first prints are rejected by FBI or other agency. The most common purpose of using FD 258 fingerprint form is to file for FBI Police clearance certificate or State police verification.